Slipped Discs. These are also called Prolapsed or Herniated Discs. There are 23 spinal discs comprising of 6 cervical discs in the neck, 12 thoracic discs in the middle of your back and 5 lumbar discs in your lower back and any spinal disc can be subject to this type of injury although the most common area for a slipped disc is in the lower back also known as the lumbar spine. The intervertebral disc is made up of a soft jelly like centre nucleus surrounded by a tough outer wall called the Annulus. The Annulus is subject to wear and tear as you get older but a slipped disc often occurs as a result of an injury such as heavy lifting. What happens to the disc? 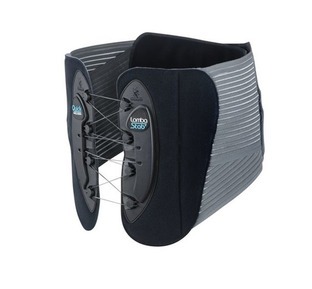 Damage to the outer wall of the disc allows the disc wall to bulge or even rupture allowing the gel inside the disc to leak out. If the damaged disc or the leaking gel then presses on structures or nerves then this can cause spinal pain and nerve pain which may radiate along the length of the compressed nerve. In the example of a slipped disc in the base of the spine this will often put pressure, or trap, the sciatic nerve which will typically give pain in the lower back running from the back of the pelvis, through your buttock and down the leg as far as your toes, this being along the course of the trapped sciatic nerve. A sensation of tingling and numbness may also be felt along the nerve. In very rare cases nerves at the very base of your spine can become compressed which may give additional symptoms of tingling or numbness to your genital region and back passage area. This may also result in disturbances with your bowel and bladder. If you experience any of these rare but serious symptoms or are in doubt you should seek immediate and urgent medical assistance. A slipped disc will rarely require surgery and there are many ways to help improve your pain. • Your GP will be able to offer medication for pain relief and if required refer you for further medical investigation. • You should try to keep gently active. 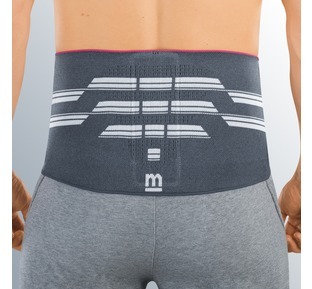 This will help keep your back mobile and speed up your recovery. • Osteopaths and Physiotherapists may use massage and manipulation to help reduce spasm and pain. 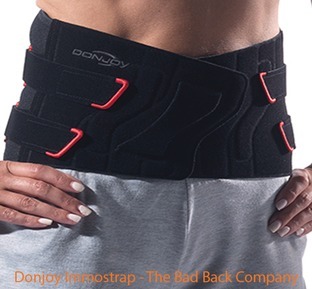 • The use of a back support can also help reduce the pain and spasm. • The use of a tens machine or device such as Paingone can also help reduce the pain and spasm.